Linus Pauling began his professional life studying atoms, and ended it best known for his thoughts on medicine. Linking these two fields was a central body of work on the nature of human blood. During the most productive thirty years of his life, between the mid-1930s and mid-1960s, Pauling's research in this area not only advanced our understanding of how blood works at the molecular level, but branched and blossomed into vital discoveries about immunology, sickle-cell anemia, genetics, evolution, and human health. This website is designed to serve as both an introduction to an important body of work as well as a reference tool for students, teachers, physicians, scientists, and members of the general public interested in the history of modern medicine. An illustrated, forty-six page account of Linus Pauling's research of how blood works at the molecular level. Read Narrative. A wealth of primary sources - nearly four-hundred letters, manuscripts, photographs, published papers, audio-visual snippets and more - provide an important scholarly perspective on the relationship between blood biochemistry and molecular disease. View All Documents and Media. Alternate View: Image Catalogue A detailed, illustrated look at all of Linus Pauling's personal and professional communications and activities for each day of the years 1940 through 1949. Presented in user-friendly calendar form. Browse Linus Pauling Day-By-Day. 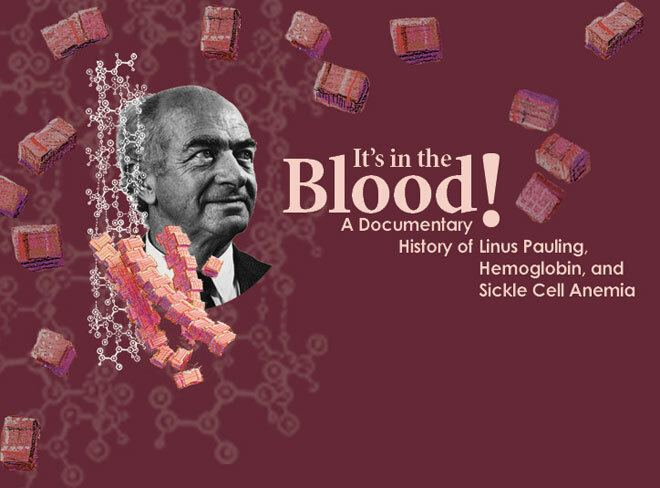 The Narrative was written by Melinda Gormley, adapted from the text of her Master of Science thesis, It’s in the Blood: The Varieties of Linus Pauling’s Work on Hemoglobin and Sickle Cell Anemia (1.8MB PDF), presented October 22, 2003, History of Science Department, Oregon State University.